Listen to an exclusive Voices from the Field interview with Fanny M. Cornejo, PEN's former Regional Coordinator for Peru, Bolivia, and Ecuador below. My name is Fanny Cornejo and I am the [former] Regional Coordinator for Peru, Bolivia, and Ecuador. 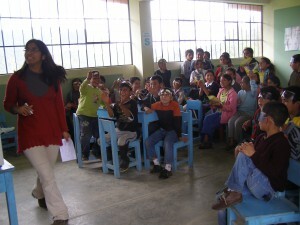 I also co-manage an educational project in Peru with the NGO Yunkawasi. I am a biologist, so back in 2005 when I started doing my research work in Peruvian Amazonia as an intern for various projects (most of them related to hunting sustainability of primates and other big mammals), I became aware that local people, not indigenous people, but recent colonizers that are living in the middle of the forest, had no awareness of the diversity and importance of the primates surrounding them. That really impacted me because these are areas of the world where you have ten or more species of primates living in the same place. You would ask local people and they would know the name of a couple of species, but they wouldn’t be really aware of what is going on. After these experiences, the idea of working on primate education started growing in my head. A couple of years afterwards when I was carrying out my research in a different type of environment in the montane forests of Peru, I started getting frustrated again because local people did not even know they had an endemic and critically endangered primate living in their backyards. Because of these two experiences, I finally decided that we had to do something. That is how I ended up teaming up with Fanny Fernandez and Yunkawasi. 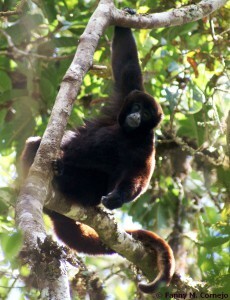 In 2008, we put together a primate education program using the endemic and critically endangered yellow-tailed woolly monkey as a flagship species. Well, there are many stories. 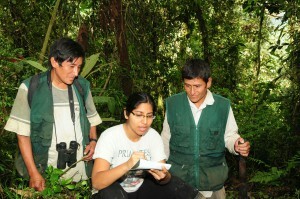 Right now, I am thinking of my field site, which is Corosha in the Tropical Andes of Peru. When I first started working in this area, the knowledge of local people about primates was very limited, even though they had a unique and critically endangered species living there. When we started working on our educational program there, with the high school, elementary school, and the adults of the area, we realized that people were proud to have a species that was unique to the area and that this species was bringing so much attention to this part of the world. It was very interesting because we were able to witness this change of mind and how people started to think about the importance of the species in a wider context, understand what it really meant to protect the species and its habitat, and the importance of the species to the ecosystem. So, after a couple of years of workshops with these people, we started to see they were all about the yellow-tailed woolly monkey, which was our flagship species. In this way, suddenly we had women that were weaving yellow-tailed woolly monkeys into their blankets and children were drawing the yellow-tailed wooly monkeys and posting them on their doors. They even went as far as organizing one activity in their school where they featured a dance of the yellow-tailed wooly monkey. This was very interesting because they did that on their own without any of my interference. In fact, I only learned about this dance of the yellow-tailed wooly monkey after it happened. It was amazing. Children were dressed up as monkeys and actually included this dance into the cultural representations of their town. For me, it was great when I learned about it. I had a very happy feeling about it because I got this sense of success. I started realizing that it was happening. People were integrating the species into their lives, they were understanding it, appreciating it, and even loving it. For me, these are the baby steps you need to have tangible conservation achievements. You need people to care and to be on the species’ side. Working with people and education in rural areas is quite a challenge on its own, but the challenge that comes to my mind is actually funding. 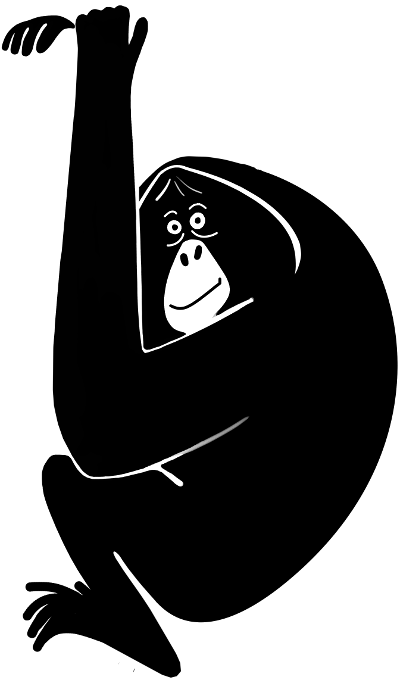 Even though primate education is very important and it can change people’s perspectives and attitudes, it is something that is very difficult to measure. It is very difficult to measure your success in tangible ways, so for funders who usually like numbers and want proof of how the project is succeeding, it is very difficult to explain to them that this is a process. Being able to demonstrate or differentiate between teaching people how to memorize things in comparison to actually making them change in their ways and views is a very complex process that takes years. In 2008, when we started with our educational program, it was very difficult for us to get funds. At the beginning, we were only getting small grants and including the educational part as a small component of bigger grants. But the interesting thing was that once we were on track with the program, a lot of unexpected funding sources appeared. We had local authorities, local NGOs, even local political parties and random people just wanting to help us in spreading the message. They would either help us with a small amount of money, such as donating materials for our drawing contest, including colored pencils, paper, or different things that we needed. It was great because it gave us this sense of community, a feeling of a joint effort. Throughout the years, because of the great help of all these people we had at the beginning, we were able to get bigger sources of funding – mainly for the educational part of our work. Things are now better. I really acknowledge that at the beginning to work with an educational program as a project on its own is very challenging and it takes time. You also need to be creative and to find novel ways of getting funding. This is a challenge, but I think it can be overcome. You just need to be very, very creative about it.